This article describes how to configure an instant message (IM) client application so that it integrates with the social features in Office 2013, including displaying presence and sending instant messages from the contact card. If you have any questions or comments about this technical article or the processes that it describes, you can contact Microsoft directly by sending an email to docthis@microsoft.com. 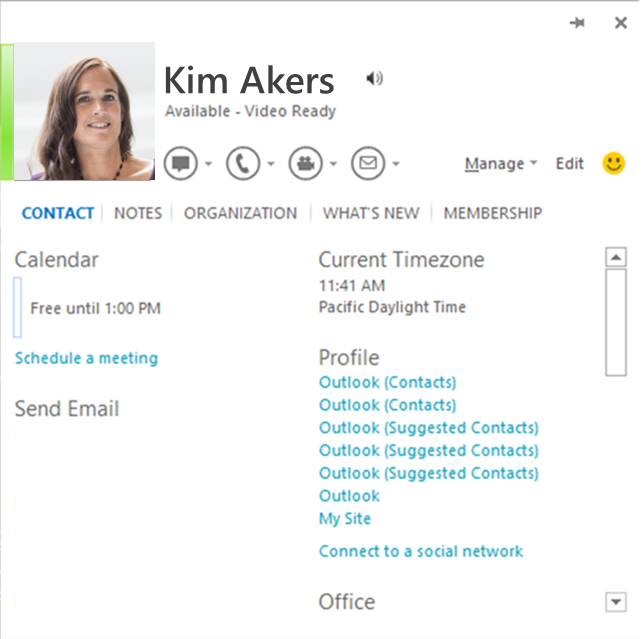 Office 2013 provides rich integration with IM client applications, including Lync 2013. This integration provides users with IM capabilities from within Word 2013, Excel 2013, PowerPoint 2013, Outlook 2013, Visio 2013, Project 2013, and OneNote 2013 as well as providing presence integration on SharePoint 2013 pages. Users can see the photo, name, presence status, and contact data for people in their contacts list. They can start an IM session, video call, or phone call directly from the contact card (the UI element in Office 2013 that surfaces contact information and communication options). Office 2013 makes it easy to stay connected to your contacts without taking you outside of your email or documents. This article uses the term IM client application to refer specifically to the application installed on a user's computer that communicates to the IM service. For example, Lync 2013 is considered an IM client application. This article does not provide details about how the IM client application communicates to the IM service or about the IM service itself. Contact availability string (for example, "Available" or "Out of Office"). Contact capability string (for example, "Video Ready"). One-click phone call launch (including SIP, phone number, voice mail, and call new number). Contact management (add to IM group). Contact location and time zone. Contact data, phone number, email address, title, and company name. To enable this integration with Office, an IM client application must implement a set of interfaces that Office provides to connect to it. The APIs for this integration are included in the UCCollborationLib namespace that is contained in the Microsoft.Office.UC.dll file, which is installed with versions of Office 2013 that include Lync / Skype for Business. The UCCollaborationLib namespace includes the interfaces that you must implement to integrate with Office. The type library for the required interfaces is embedded in Lync 2013/Skype for Business. For third-party integrators, this works only when both Lync 2013 and Skype for Business are installed on the target machine. If you are integrating using Office Standard, you need to extract the type library and install it on the target machine. The Lync 2013 SDK includes the Microsoft.Office.UC.dll file. Office 2010 does not display the contact's photo. You must download the Microsoft.Office.Uc.dll file separately from Office 2010. The Lync 2010 SDK includes the Microsoft.Office.UC.dll file for Office 2010. When the Office application calls the IUCOfficeIntegration.GetAuthenticationInfo method on the IM client application, it passes in the string "14.0.0.0". Office 2010 enumerates all groups and contacts as soon as it connects to an IM client application. It determines the capabilities of the currently signed-in user (local user), including getting the user's contacts, determining the user's presence, and determining the user's IM capabilities (instant messaging, video chat, VOIP, and so on). It gets presence information for the local user's contacts. The Office application looks for several specific keys and entries in the registry to discover the default IM client application. If it discovers a default IM client application, it then attempts to connect to it. The Office application looks to see if the HKEY_CURRENT_USER\Software\IM Providers\DefaultIMApp subkey in the registry is set and reads the application name listed there. The Office application then reads the HKEY_CURRENT_USER\Software\IM Providers\ Application name\UpAndRunning key and monitors the value for changes. The Office application next reads the HKEY_LOCAL_MACHINE\Software\IM Providers\ Application name registry key and gets the ProcessName and class ID (CLSID) values stored there. Once the IM client application has completed its start sequence successfully and registered all of the classes correctly for the presence integration, it sets the HKEY_CURRENT_USER\Software\IM Providers\ Application name\UpAndRunning key to "2", indicating that the client application is running. When the Office application discovers that the HKEY_CURRENT_USER\Software\IM Providers\ Application name\UpAndRunning key has been set to "2", it checks the list of running processes on the computer for the process name of the IM client application. Once the Office application finds the process that the IM client application uses, the Office application calls CoCreateInstance using the CLSID to establish a connection to the IM client application as an out-of-process COM server. The Office application calls IUnknown::QueryInterface method to check for the IUCOfficeIntegration interface. The Office application then calls the IUCOfficeIntegration.GetAuthenticationInfo method, passing in the highest supported integration version (for example, "15.0.0.0"). For legacy reasons, the IM client application must return the exact value <authenticationinfo> to the call to GetAuthenticationInfo if it supports the version of Office passed in as a parameter. If the IM client application fails to return a value, the Office application calls the GetAuthenticationInfo method again with the next highest supported version of Office (for example, "14.0.0.0"). If the Office application encounters an error on any of the steps above, it backs out and presence integration is not established again during the session of the Office application. The Office application gets an ILyncClient object by calling the IUCOfficeIntegration.GetInterface method, passing in the oiInterfaceLyncClient constant from the UCCollaborationLib.OIInterface enumeration. The Office application gets an IAutomation object by calling the IUCOfficeIntegration.GetInterface method, passing in the oiInterfaceAutomation constant from the OIInterface enumeration. The Office application sets up the _ILyncClientEvents event listener. The Office application sets up the _IUCOfficeIntegrationEvents event listener. The Office application gets the sign-in state from the IM client application by accessing the ILyncClient.State property. The Office application gets the capabilities of the IM client application by calling the IUCOfficeIntegration.GetSupportedFeatures method, which returns a flag from the UCCollaborationLib.OIFeature enumeration. The Office application accesses the ILyncClient.Self property to get a reference to an ISelf object. If the IM client application supports the IClient2 interface, Office tries to get an IContactManager object by accessing the IClient2.PrivateContactManager property. If the IM application does not support the IClient2 interface, Office application gets an IContactManager object by accessing the ILyncClient.ContactManager property. The IM client application must successfully return an IContactManager object before any other IM capabilities can be established. The Office application accesses the ILyncClient.Uri property and then calls IContactManager.GetContactByUri to get the IContact object associated with the local user. The Office application then makes several calls to IContact.CanStart to establish the capabilities of the local user, passing in the values for ModalityTypes.ucModalityInstantMessage and ModalityTypes.ucModalityAudioVideo successively. The Office application calls IContact.GetContactInformation to get a presence item from the contact. The Office application then subscribes to presence status changes from the contact. It calls IContactManager.CreateSubscription to get an IContactSubscription object. It then calls IContactSubscription.AddContact to add the contact to the subscription and then calls IContactSubscription.Subscribe to get changes in the contact's status. If the IM application supports IContact2, Office attempts to get presence information by calling IContact2.BatchGetContactInformation2. The Office application then retrieves the presence properties for the contact by calling IContact.BatchGetContactInformation. The Office application can get a second set of presence properties by accessing the IContact.Settings property. Finally, the Office application gets the contact's group membership by accessing the IContact.CustomGroups property. This returns an IGroupCollection collection that includes all of the IGroup objects that the contact belongs to. When the Office 2013 application detects the OnShuttingDown event from the IM application, it disconnects silently. However, if the Office application shuts down before the IM application, the Office application does not guarantee that the connection is cleaned up. The IM application must handle client connection leaks. As mentioned previously, the IM-capable Office 2013 applications look for specific keys, entries, and values in the registry to discover the IM client application to connect to. These registry values provide the Office application with the process name and CLSID of the class that acts as the entry point to the IM client application's object model (that is, the class that implements the IUCOfficeIntegration interface). The Office application co-creates that class and connects as a client to the out-of-process COM server in the IM client application. Use Table 1 to identify the keys, entries, and values that must be written in the registry to integrate an IM client application with Office. The name of the third-party IM client application. The process name of the third-party IM client application. A class ID (CLSID) for the root, cocreatable class in the IM application (the class that implements the IUCOfficeIntegration interface). The name of the IM client application. This must be the same as the name at the top-level registry key (hive) in the HKEY_LOCAL_MACHINE. NOTE: The application name registry key must be the same as the value of the DefaultIMApp entry. There are three interfaces from the UCCollaborationLib namespace that the executable (or COM server) of an IM client application must implement so that it can integrate with Office. If these interfaces are not implemented, the Office application backs out during the initialization process and the connection with the IM client application is not established. IUCOfficeIntegration—Although not required, the _IUCOfficeIntegrationEvents interface should also be implemented in the same derived class. ILyncClient—Although not required, the _ILyncClientEvents interface should also be implemented in the same derived class. The IUCOfficeIntegration interface provides the entry-point for an Office application to connect to the IM client application. The interface defines three methods that an Office application calls as part of the process of initiating a connection with the IM client application. The class that implements the IUCOfficeIntegration interface must be co-creatable so that Office can co-create an instance of it. In addition, it must expose the CLSID that is entered as the value for the GUID entry in the HKEY_LOCAL_MACHINE\Software\IM Providers\ Application name registry key. The class that inherits from IUCOfficeIntegration should also implement the _IUCOfficeIntegrationEvents interface. The _IUCOfficeIntegrationEvents interface contains the members that expose the event handlers of the IUCOfficeIntegration interface. Table 2 shows the members that must be implemented in the class that inherits from IUCOfficeIntegration and _IUCOfficeIntegration. For more information about the IUCOfficeIntegration and _IUCOfficeIntegrationEvents interfaces and their members, see UCCollaborationLib.IUCOfficeIntegration and UCCollaborationLib._IUCOfficeIntegrationEvents. Gets the authentication info string. Gets the interface of a particular version. Gets the supported Office integration features. The event raised when the IM client application is trying to shut down. Use the following code to define a class that inherits from the IUCOfficeIntegration and _IUCOfficeIntegration interfaces within an IM client application. // with Office as an IM provider. The GetAuthenticationInfo method takes a string as an argument for the version parameter. When the Office application calls this method, it passes in one of two strings for the argument, depending on the version of Office. When the Office application supplies the method with the version of Office that the IM client application supports (that is, supports the functionality), the GetAuthenticationInfo method returns a hard-coded XML string <authenticationinfo>. Use the following code to implement the GetAuthentication method within the IM client application code. // Define the version of Office that the IM client application supports. // Do a simple check for equivalency. // return the string literal "<authenticationinfo>" exactly. The GetInterface method shuttles references to classes to the calling code, depending on what is passed in as an argument for the interface parameter. When an Office application calls the GetInterface method, it passes in one of two values for the interface parameter: either the oiInterfaceILyncClient constant (1) or the oiInterfaceIAutomation constant (2) of the UCCollaborationLib.OIInterface enumeration. If the Office application passes in the oiInterfaceILyncClient constant, the GetInterface method returns a reference to a class that implements the ILyncClient interface. If the Office application passes in the oiInterfaceIAutomation constant, the GetInterface method returns a class that implements the IAutomation interface. Use the following code example to implement the GetInterface method within the IM client application code. // for the _interface parameter. // from ILyncClient, so it returns such an object. // from IAutomation, so it returns such an object. The GetSupportedFeatures method returns information about the IM features that the IM client application supports. It takes a string for its only parameter, version. When the Office application calls the GetSupportFeatures method, the method returns a value from the UCCollaborationLib.OIFeature enumeration. The returned value specifies the capabilities of the IM client, where each capability of the IM client application is indicated to the Office application by adding a flag to the value. Use the following code example to implement the GetSupportFeatures method within the IM client application code. The ILyncClient interface maps to the capabilities of the IM client application itself. It exposes properties that refer to the person who is signed into the application (the local user, represented by the UCCollaborationLib.ISelf interface), the state of the application, the list of contacts for the local user, and several other settings. When it's trying to connect to the IM client application, the Office application gets a reference to an object that implements the ILyncClient interface. From that reference, Office can access much of the functionality of the IM client application. In addition, the class that implements the ILyncClient interface should also implement the _ILyncClientEvents interface. The _ILyncClientEvents interface exposes several of the events that are required for monitoring the state of the IM client application. Table 3 shows the members that must be implemented in the class that inherits from ILyncClient and _ILyncClientEvents. Any member of the ILyncClient or _ILyncClientEvents interface not listed in the table must be present but does not need to be implemented. Members that are present but not implemented can throw a NotImplementedException or E_NOTIMPL error. For more information about the ILyncClient and _ILyncClientEvents interfaces and their members, see UCCollaborationLib.ILyncClient and UCCollaborationLib._ILyncClientEvents. Gets the contact group manager. Starts the IM client application sign-in process with a specific availability. Gets the current platform state. Gets the URI of the IM client application. Raised when the IM client application state changes. You should handle this event and get the eventData.NewState property. The event is raised for all processes bound to an instance of an IM client application when any subsystem in the application causes the state change. During the initialization process, Office accesses the ILyncClient.State property. This property needs to return a value from the UCCollaborationLib.ClientState enumeration. The State property stores the current status of the IM client application. It must be set and updated throughout the IM client application session. When the IM client application signs in, signs out, or shuts down, it should set the State property. It is best to set this property within the ILyncClient.SignIn and ILyncClient.SignOut methods, as the following example demonstrates. // This field is of a type that implements the ISelf interface. // the contact information of the currently signed-in user. // Raise the _ILyncClientEvents.OnStateChanged event. The following code example demonstrates how to set up the event listener using the _ ILyncClientEvents and _ IUCOfficeIntegrationEvents interfaces. // This method is called by the IM application when it is beginning to shut down. // into a call to _IUCOfficeIntegrationEvents.OnShuttingDown. // This notifies Office applications that the IM application is going away. // You must implement LyncClient because the event handlers in _ILyncClientEvents expect you to pass a LyncClient interface. // Notifies Office apps that the IM client state (signed out, signing in, singed in, signing out, etc) has changed. // Notifies Office apps that the IM client has been delayed from signing in and gives an estimated delay time. // Notifies Office apps that the capabilities of this IM client have changed. // Notifies Office apps that a DelegatorClient object has been added to the IM client object. // Notifies Office apps that a DelegatorClient object has been removed from the IM client object. The IAutomation interface automates features of the IM client application. It can be used to start conversations, join conferences, and provide extensibility window context. Table 4 shows the members that must be implemented in the class that inherits from IAutomation. Any member of the IAutomation interface not listed in the table must be present but does not need to be implemented. Members that are present but not implemented can throw a NotImplementedException or E_NOTIMPL error. For more information about the IAutomation interface and its members, see UCCollaborationLib.IAutomation. Starts a conversation using the specified conversation modality. An instance of IConversationWindow is returned. The IContact or IContact2 interface. The IContactManager and _IContactManagerEvents interfaces. The IGroup and IGroupCollection interfaces. The IContact interface represents an IM client application user. The interface exposes presence, available modalities, group membership, and contact type properties for a user. To start a conversation with another user, you must provide that user instance of IContact. Table 5 shows the members that must be implemented in the class that inherits from IContact. Any member of the IContact interface not listed in the table must be present but does not need to be implemented. Members that are present but not implemented can throw a NotImplementedException or E_NOTIMPL error. For more information about the IContact interface and its members, see UCCollaborationLib.IContact. Returns true if a given type of modality can be started on the contact. Gets one presence item from a publishing contact. Gets multiple presence items from a publishing contact. Gets a collection of contact properties. Gets a collection of groups that the contact is a member of. During the initialization process, the Office application calls the IContact.CanStart method to determine the IM capabilities for the local user. The CanStart method takes a flag from the UCCollaborationLib.ModalityTypes enumeration as an argument for the _modalityTypes parameter. If the current user can engage in the requested modality (that is, the user is capable of instant messaging, audio and video messaging, or application sharing), the CanStart method returns true. // user by using flags from the ModalityTypes enumeration. // Perform a simple test for equivalency. The GetContactInformation method retrieves information about the contact from the IContact object. The calling code needs to pass in a value from the UCCollaborationLib.ContactInformationType enumeration for the _contactInformationType parameter, which indicates the data to be retrieved. // on the value passed in for the _contactInformationType parameter. // Return the URI associated with the contact. // Return the display name associated with the contact. // Additional implementation details omitted. Similar to the GetContactInformation, the BatchGetContactInformation method retrieves multiple presence items about the contact from the IContact object. The calling code needs to pass in an array of values from the ContactInformationType enumeration for the _contactInformationTypes parameter. The method returns an UCCollaborationLib.IContactInformationDictionary object that contains the requested data. The IContact.Settings property returns an IContactSettingDictionary object that contains custom properties about the contact. The IContact.CustomGroups property returns an IGroupCollection object that includes all of the groups of which the contact is a member. During the initialization process, the Office application gets the data for the current user by accessing the ILyncClient.Self property, which must return an ISelf object. The ISelf interface represents the local, signed-in IM client application user. Table 6 shows the members that must be implemented in the class that inherits from ISelf. Any member of the ISelf interface not listed in the table must be present but does not need to be implemented. Members that are present but not implemented can throw a NotImplementedException or E_NOTIMPL error. Gets the IContact object associated with the local user. Presence, available modalities, group membership, and contact type properties for the local user are exposed through the ISelf.Contact property (which returns an IContact object). During the initialization process, the Office application accesses the ISelf.Contact property to get a reference to the contact information for the local user. Use the following code to define a class that inherits from the ISelf interface that implements the Contact property. // Declare a private field to store contact data for local user. // must supply contact data. // to the IContact object that represents the local user. The IContactManager object manages the contacts for the local user, including the local user's own contact information. The Office application uses an IContactManager object to access IContact objects that correspond to the local user's contacts. Table 7 shows the members that must be implemented in the class that inherits from IContactManager and _IContactManagerEvents. Any member of the IContactManager interface not listed in the table must be present but does not need to be implemented. Members that are present but not implemented can throw a NotImplementedException or E_NOTIMPL error. For more information about the IContactManager and _IContactManagerEvents interfaces and their members, see UCCollaborationLib.IContactManager and UCCollaborationLib._IContactManagerEvents. Finds or creates a new contact instance by using the contact URI. Creates an ISubscription object that can be used for batching subscriptions or queries. Looks up a contact or distribution group. Raised when a group is added to a group collection. The updated group collection can be obtained from the IContactManager.Groups property. Raised when a group is removed from a group collection. The updated group collection can be obtained from the IContactManager.Groups property. Raised when a search provider's status changes. Office calls IContactManager.GetContactByUri to get a contact's presence information, by using the SIP address of the contact. When a contact is configured for an SIP address in the Active Directory, Office determines this address for a contact and calls GetContactByUri, passing the SIP address of the contact in for the _contactUri parameter. When Office cannot determine the SIP address for the contact, it calls the IContactManager.Lookup method to find the SIP by using the IM service. Here Office passes in the best data that it can find for the contact (for example, just the email address for the contact). The Lookup method asynchronously returns an AsynchronousOperation object. When it invokes the callback, the Lookup method should return the success or failure of the operation in addition to the URI of the contact. // Declare a Contact variable to contain information about the contact. // contact is a part of the group. // did not, create a new contact. // Return the contact to the calling code. The Office application needs to subscribe to presence changes for an individual contact. Thus, when a contact's presence status changes, the IM server alerts the IM client application—thereby alerting the Office application. To do this, the Office application calls the IContactManager.CreateSubscription method to create a new IContactSubscription object for this request. // Declare a private field to contain an IContactSubscription object. // with the IContactManager object. The IGroup object represents a collection of contacts with additional properties for identifying the contact collection by a collective group name. An IGroupCollection object represents a collection of IGroup objects defined by a local user and the IM client application. The Office application uses the IGroupCollection and IGroup objects to access the local user's contacts. Table 9 shows the members that must be implemented in the classes that inherit from IGroup and IGroupCollection in the following table. Any member of the IGroup interface not listed in the table must be present but does not need to be implemented. Members that are present but not implemented can throw a NotImplementedException or E_NOTIMPL error. For more information about the IGroup and IGroupCollection interfaces and their members, see UCCollaborationLib.IGroup and UCCollaborationLib.IGroupCollection. Returns the IGroup object at the specified index in the collection. Returns the ID of the group. When the Office application gets the information for the local user, it accesses the group memberships of the contact (local user) by calling the IContact.CustomGroups property, which returns an IGroupCollection object. The IGroupCollection must contain an array (or List) of IGroup objects. The class that derives from IGroupCollection must expose a Count property, which returns the number of items in the collection, and an indexer method, this(int), which returns an IGroup object from the collection. The IContactSubscription interface allows you to specify the contacts to receive presence information updates for and the types of presence information that trigger a notification. Office applications use an IContactSubscription object to register changes to contact's presence status. Table 10 shows the members that must be implemented in the classes that inherit from IContactSubscription. Any member of the IContactSubscription interface not listed in the table must be present but does not need to be implemented. Members that are present but not implemented can throw a NotImplementedException or E_NOTIMPL error. For more information about the IContactSubscription interface and its members, see UCCollaborationLib.IContactSubscription. Adds a contact to the subscription object. Helps the IM client application to monitor presence for a contact. The IContactSubscription interface must contain a reference to all the IContact objects that it monitors, using an array or a List. The IContactSubscription.AddContact method adds an IContact object for the to the underlying data structure of the IContactSubscription object, thereby adding a new contact to monitor for presence changes. // Store references to all of the IContact objects to subscribe to. // Add a new IContact object to the collection of contacts. The IContactSubscription.Subscribe method allows an IM client application to access presence observers for the contact. It can use a polling strategy to get the presence from the server for the contacts for that the IM client application has subscribed to. The Subscribe method is helpful in situations where presence is requested for someone outside of a user's contact list (for example, from a larger public network). The IContactEndPoint represents a telephone number from a contact's collection of telephone numbers. Table 11 shows the members that must be implemented in the classes that inherit from IContactEndPoint. Any member of the IContactEndPoint interface not listed in the table must be present but does not need to be implemented. Members that are present but not implemented can throw a NotImplementedException or E_NOTIMPL error. For more information about the IContactEndPoint interface and its members, see UCCollaborationLib.IContactEndpoint. The ILocaleString is a localized string structure that contains both a localized string and the locale ID of the localization. The ILocaleString interface is used to format the custom status string on the contact card. Table 12 shows the members that must be implemented in the classes that inherit from ILocaleString. Any member of the ILocaleString interface not listed in the table must be present but does not need to be implemented. Members that are present but not implemented can throw a NotImplementedException or E_NOTIMPL error. For more information about the ILocalString interface and its members, see UCCollaborationLib.ILocaleString.